The 1:10,000-scale 3D model of Mt. Pulag National Park was completed in 1999 in the framework of the National Integrated Protected Areas Programme (NIPAP). It covers portions of the provinces of Benguet, Ifugao and Nueva Vizcaya. The model covers a total area of 360 km2 and included at that time portions of four Ancestral Domain Claims. Participants in the mapping exercise included representatives from the Ibaloi, Kalanguya, Kankana-eys and Karaos Indigenous communities, Local Government Officials, the Philippines Department of Environment and Natural resources (DENR), and the National Power Corporation (NAPOCOR). 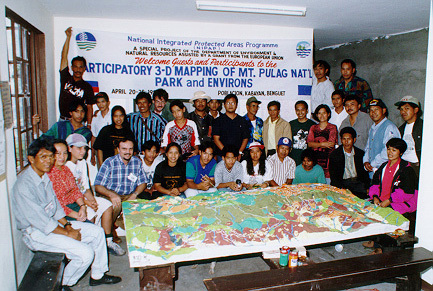 In line with the 1992 Earth Summit, the European Union and the Government of the Philippines, initiated and co-financed the National Integrated Protected Areas Programme (NIPAP). 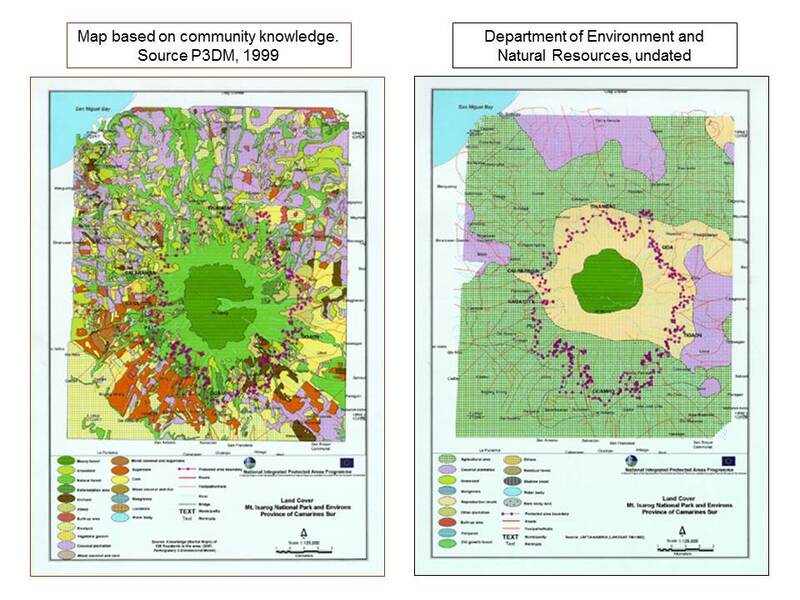 This was a six-year (1995-2001) intervention aimed at establishing eight protected areas within the framework of the Philippine protected area system. The system strongly supports the participation of local communities in planning and implementing policies and actions to conserve biodiversity. The challenge faced by the Programme has been how to give due weight to the interests of local communities in delineating protected area boundaries, identifying resource-use zones and formulating policies on protected area management. The P3DM exercise resulted in a wealth of data gathered thanks to the participation of more than 75 knowledge holders (20% women) living in the area. The two maps below show a comparison between a map generated based on data extracted from the 3D model and a map generated via probably poorly ground-thruthed satellite imagery. “Vegetable gardens” were identified as “grassland” and “farms resulting from slash and burn”were identified as “brushland”.